Built strong - easy to use - perfect for a variety of applications! Separators are designed to separate the solids from liquid in a wide range of substances such as sludge, sewage, manure, vegetables, food waste/byproducts, paper pulp, and more. 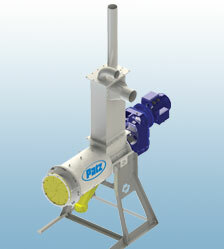 Reduce waste volumes by extracting more solids from liquid. Re-use separated solids (vegetables and food waste/byproducts) as animal feed or organic fertilizer. Easily shovel, store, and convey the odorless, solid material (≤30% dry matter). Process material when you want/need. 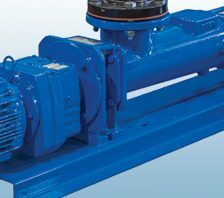 Continuous duty—low amp draw units with minimal energy requirements. SEPCOM™ is a trademark of WAMGROUP®. *Figures are based on clean water. **Depends on type of material, operating conditions, and maintenance. ‡Based on 12 hour/daily operation. 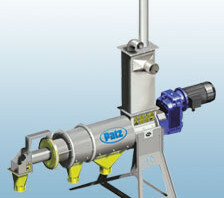 Hot-dip galvanized steel open frame support allows for pipe connection flexibility beneath separator. The wedge wire dewatering screen’s stainless steel construction produces high strength and extended service life suitable for solids-liquid separation in numerous industries. A wide selection of screen sizes are available, producing ≤30% dry matter. Wear-resistant heavy duty stainless steel screw. Stainless steel reinforced diaphragm outlet applies self-adjusting counter-pressure which produces dryer consistent solids. Patented in various countries. Your choice of motors, ask your Patz Dealer for details. Stainless steel loading hopper resists rust for long service life.